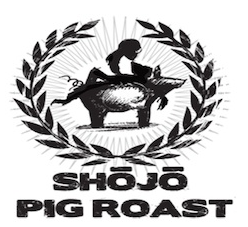 Shōjō, the new modern Asian restaurant in Chinatown, invites you to their first Pig Roast. The Pig Roast culminates in a prix-fixe meal, each dish utilizing the house-roasted pig from nose to tail. The cost is $50 per person for a 5 course meal, or $80 per person for 8 courses. There is an optional cocktail pairing for an additional $50. Wednesday, September 19th with seatings at 6 pm and 9 pm. The meal will take place in the dining room at Shōjō, which is located at 9a Tyler Street in Chinatown. For more information and to reserve a seat with a $20 deposit, visit http://shojopigroast.eventbrite.com. The restaurant can be reached at 617.423.7888. 0 Response to "Pig Roast @ Shojo - 9/19"